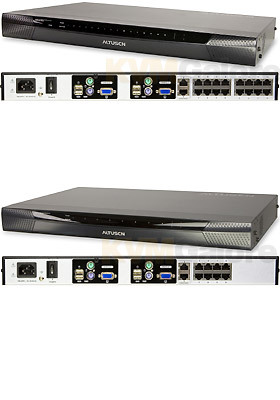 KH-Series 2-User CAT-5 KVM Switches CAT-5 KVM switches are dual channel devices, allowing two operators to independently and simultaneous access up to 16 directly connected computers, and up a maximum of 4096 servers through three level cascading. Cascading is achieved via dedicated RJ-45 cascade ports and CAT-5e cabling. The KVMs support mixed environments of Windows, Mac , Linux, Unix, Novell, and OS/2 and employs keyboard emulation for special Mac and Sun keys.